one happy little crafter: Thinking of you Diane. Hi to you all, and thank you for popping in. I'd like to welcome my newest follower, Sarah, who is also one of our lovely new cutie pie teamies too - but not only that, but that's me now at 200 followers! Thank you all so much.......I might have to organise some candy to celebrate! Anyway, onto todays card and this is one that I actually made a couple of weeks ago as one of my DT cards for the Crafty Friends challenge - however, due to our lovely leader Diane having some health problems at the moment, this challenge has closed for the time being. I decided to go ahead and blog this card, and say that my thoughts and prayers are still with Diane. 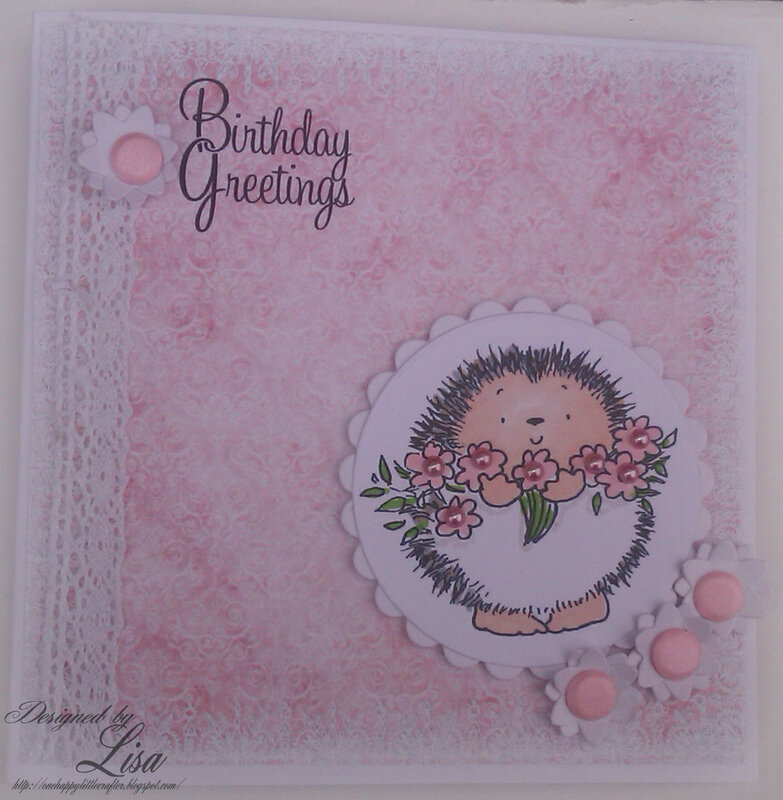 I have coloured the adorable PB hedgie with promarkers and added hobbyhouse pearls to the flowers. I also used a joycraft flower die and added card candi, the paper is from Bearly Mine designs and I added some sticky backed lace to finish. Well done on your 200 followers Lisa! Such a beautiful card. I love the cute image and pretty flowers. I was so sad to read about Diane too, I wish her all the best with her treatment. Such a cute Card! I love that Image. Thanks for joining us at PFP this week. What a cute card, I love your sweet image & those pretty little flowers. Thanks for joining us at Passion For Promarkers this week.